Thought Bubble 2015 - Last Convention of the Year. It's always great to end the year on a high, and last year Thought Bubble was certainly that, with our best TB show ever from the perspective of sales made. Saturday the doors opened on a cold Yorkshire day and people quickly filled the hall. New Dock Hall being one of three, I wondered if the other halls were similarly busy and a quick dash around them later in the day actually proved this to be the case. The Convention has grown year on year and this year I actually felt that the number of halls and stalls were justified by the number of people looking to buy comics. This year we were sandwiched between the very impressive Improper Books, who have a whole range of very nicely printed books of great quality, and Do Gooder Comics, with their great little Dungeon Fun comic. 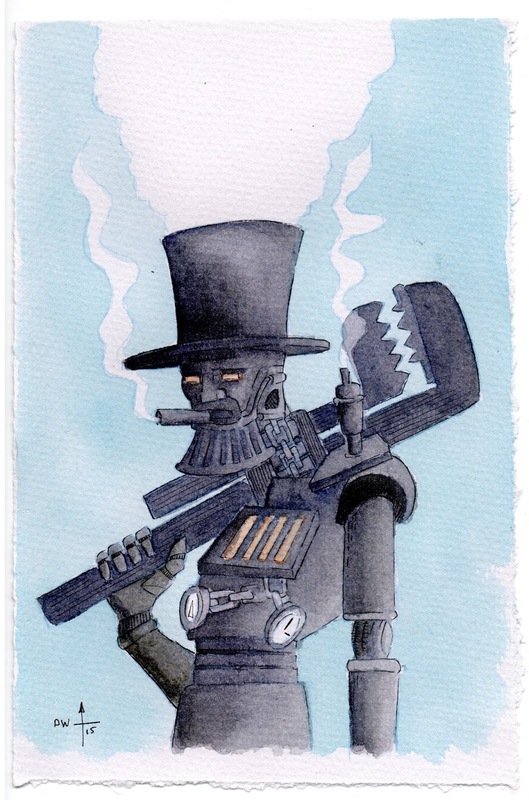 For the first time I brought some of my own sketches to produce some limited Stephenson's Robot sketch and Tarot card packs and the sketches worked a treat, encouraging people to buy the first two issues. This works so well for WesterNoir I thought it worth trying. During a busy day I managed to spend a few minutes catching up with Andy Bloor at his stall, selling copies of Midnight Man and his new 'Andy Thology', which includes along with some of his Accent UK anthology contributions, sketches and a couple of new Midnight Man pages. It's great to see Andy at his table enjoying the Cons. Saturday ended with us looking at a very productive day, and we celebrated with what is becoming a traditional pub meal with Lucky Target Comic's Sumyra and whoever happens to helping at her stall. No Chris Dingsdale this year though, I hear he was out of the country on a Yak drive or some such, but we were joined by long time friend Tony Hitchman. A late night talking comics lead nicely into Sunday. Sunday is always more relaxed, giving me time to spend longer looking around, and spend some money. This year however my purchases were limited to The Wrenchies (which I queued to get signed (and a sketch)) from Farel Dalrymple (I've been a fan of his since Popgun War), 2 Sisters (which I got signed by Matt Kindt along with my copy of Pistolwhip) and the first three issues of Dean Beattie's great Random Trials. I have to limit spending at these events, which is really difficult, as I need to save as much as I can for the next WesterNoir and Stephenson's Robot print bills. Sunday, whilst not as successful sales wise as Saturday, was a pretty good day. We got to meet a few great new artists who we may well work with us on some future books and I also got to chat to Dave Hitchcock and show him the colour effect I'd added to his pages for a future Stephenson's Robot back story, which he was very happy with. I disappeared from the table for more than an hour and caught up with an old boss from my day job. Rosemary lives in Leeds and yet I've never mentioned the fact that I go there every year for TB. That is until this year. It was really great catching up and hard to believe that 15 years had passed. Looking back over the two days it was great to have so many people buy the WesterNoir sketch packs but there is nothing more rewarding than have customers go straight to issues 5 and 6 (which weren't available at last year's event). People are really getting into the story. So, another great Thought Bubble end to the comic con calendar on what has been by far our most successful year yet. Thanks go out to everyone who has come to our stall over the year and talk comics and maybe try some of our books. Hope to see you all again next year. 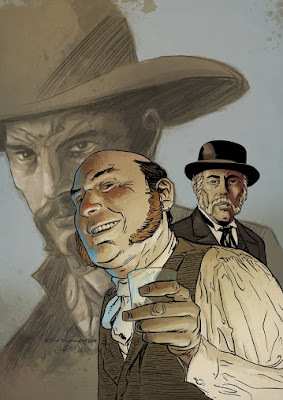 WesterNoir Issue 5 has been reviewed over at Down The Tubes. Just in time for this weekend's Thought Bubble, Jeremy Briggs has posted his review of issue 5 over at DownTheTubes.net. With issue 6 just printed, there will be two new WesterNoir books available at Thought Bubble this year, I love it when a plan comes together. Getting ready for Thought Bubble. Next weekend Accent UK will have a table at Thought Bubble, our last convention of the year. I came across the remains of some poor bird whilst walking the dog. 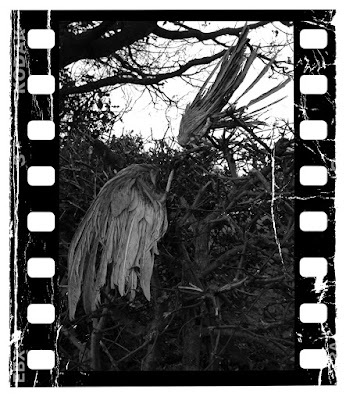 Looks like a pretty grim end for it and the fact that the skeletal wings were about 5 foot off the ground in a hawthorn hedge seems to point at a bird of prey being the killer, not that I'm trying to pin the blame on anyone in particular. Sad though, and I almost didn't spot it as it all seemed to blend in. My dog was, of course, none the wiser as she's more interested in hunting for mushrooms these days. She's given up on rabbits that run across the road in front of us now and then as they move too fast, that and the fact that I'm on the other end of the lead making sure she gets nowhere near them. No, mushrooms move much slower.